Staphylococcus aureus; Enterotoxins; Polymerase Chain Reaction; Methicillin-resistant Staphylococcus aureus; Food. Objectives: The aims of our study were to evaluate the prevalence of Staphylococcus aureus (S. aureus) strains in food samples of animal origin, examine their antibacterial susceptibility pattern, and to detect staphylococcal enterotoxin (SEs) genes and the mecA gene in isolated S. aureus strains using the polymerase chain reaction (PCR). Methods: A total of 1050 food samples including 671 raw milk and dairy products and 379 raw meats were collected between September 2013 and June 2014 in Hamadan, Iran. Food samples were analyzed for S. aureus identification. The antibiotic susceptibility pattern of all isolates was determined using the disk agar diffusion method followed by detecting mecA resistance gene using PCR. In addition, harboring of SE genes were determined using a multiplex PCR assay targeting nine genes. Results: A total of 98 (9.3%) S. aureus strains were isolated from 1050 food samples. Of the 98 isolates examined, the most frequent resistance was observed to erythromycin (30.6%), followed by tetracycline (29.6%), gentamicin (27.6%), clindamycin (26.5%), ciprofloxacin and rifampin (24.5%), trimethoprim-sulfamethoxazole (14.3%), and cefoxitin (5.1%). All cefoxitin resistant isolates were positive for mecA. The prevalence of SEs was 77.6% (n=76). Among the genes that code classic enterotoxins, sea was the most frequent and was carried by 25.5% of isolates, followed by see in 18.4%, sed in 11.2%, sec in 5.1%, and seb in 4.1% of isolates. Among the detected enterotoxins, seg was the predominantly identified enterotoxin gene in isolates with prevalence of 35.7%. The seh gene with prevalence of 1% and sei gene with 3.1% were other detected enterotoxins with low frequencies. Conclusions: The high prevalence of SE genes detected indicates a potential risk for causing animal-originated food poisoning. The increasing prevalence of community-acquired MRSA and its emerging antibiotic resistance in foods is a serious problem for public health. We aim to evaluate the prevalence of S. aureus strains in food samples of animal origin and to examine their antibacterial susceptibility pattern as well as to use PCR for the molecular detection of the SEs genes and the mecA gene in the isolated strains. A total of 1050 food samples were purchased and collected between September 2013 and June 2014, in Hamadan, Iran. The samples were kept in an insulated ice box and transferred to the laboratory and examined within 1–2 hours for the presence of S. aureus according to the Iran national standard (number=1194) for S. aureus identification. Total DNA was extracted from overnight-grown pure isolates using the DNA extraction Kit (BioFlux Co., Tokyo, Japan), according to the manufacturer’s instructions. The quality of extracted DNA was assessed spectrophotometrically by the Nanodrop ND-1000 (Nanodrop Technologies, Inc., Delaware, USA) using 2% agarose gel in 1x TBE buffer. The PCR assay targeting mecA gene coding methicillin-resistance was performed for all isolates.15,16 The reaction mixture for the single target amplification PCR assay was performed as previously described. Table 1: Primer sequences used for the polymerase chain reaction (PCR) assay in this study. For confirmation of PCR product, one sample of each of the enterotoxins gene and mecA PCR products (amplicons) were sequenced (Bioneer Co., Korea) and the data were analyzed using the Chromas software. All categorical (continuous) variables were compared using the 2-tailed chi-square test or Fisher’s exact test; p-values of ≤0.050 were considered statistically significant. All statistical analyses were performed using the SPSS (SPPS Inc., Chicago, USA) version 20 software package. Table 2: Information of the collected samples and their polymerase chain reaction (PCR) assay results. A total of 98 (9.3%) S. aureus strains from 1050 food samples were isolated, identified and confirmed by PCR assay targeting the nuc gene [Figure 1]. They included 36 (9.5%) isolates from the 379 raw meat samples and 62 (9.2%) isolates from the 671 raw milk and dairy product samples. The total number of S. aureus isolated among the various collected food type samples has been shown in Table 2. Table 3 shows the antimicrobial susceptibility patterns of the 98 S. aureus isolates examined. The mecA gene was detected in all MRSA strains, which composed 5.1% of all S.aureus strains [Figure 1]. Prevalence of SEs was determined to be 77.6% (n=76); 79.0% (n=49) in raw milk and dairy products and 75.0% (n=27) in raw meat samples. The percentages of enterotoxigenic strains isolated can be found in Table 2. The genes of classical enterotoxins (sea, seb, sec, sed, and see) were carried in 63 (64.3%) isolates and those of new enterotoxins (seg, seh, sei, and sej) were carried in 39 (39.8%) of isolates [Figure 1]. Among the genes that code classic enterotoxins, sea gene was the most frequent and was carried by 25 (25.5%) isolates [Table 2]. All our sequenced strains with related PCR product showed the same DNA sequences therefore all PCR assay results were confirmed. Table 3: Results of antimicrobial susceptibility of Staphylococcus aureus using disk diffusion method. Figure 1: Gel electrophoresis for PCR assays products. Lane M: 100-bp DNA size marker; lane 1: 279-bp amplicon of nuc for S. aureus positive control (ATCC 25423); lane 2: 279-bp amplicon of nuc for food sample; lane 3: 310-bp amplicon for mecA; lane 4: 323-, 482- and 560-bp amplicons for seg, see and sea, respectively; lane 5: 404-bp amplicon for seb; lane 6: 376-bp amplicon for seh; lane 7: 461-bp amplicon for sei; lane 8: 275- and 492-bp amplicons for sec and sed, respectively; line 9: S. epidermidis (negative control); and lane 10: sample without DNA template (negative control). In our study, we aimed to determine the prevalence of enterotoxin producing S. aureus strains collected from foods of animal origin and characterize them. Several phenotypic and genotypic methods were used to detect the presence of enterotoxin and antibiotic resistance genes and to determine the antibacterial susceptibility pattern. This inconsistency in the reported prevalence of S. aureus between meat and dairy product samples can be explained by contaminated milk and dairy products via cows and/or sheep with mastitis and during the pasteurization step by human/environmental sources or instruments and equipment with a low standard of cleanliness. Furthermore, cheeses produced from raw and unpasteurized milk are considered significant agents in the spread of S. aureus food poisoning. There was no statistically significant difference between raw meat and dairy product samples in antibacterial susceptibility patterns. In addition, statistical analysis comparing antibiotic resistance patterns between CA-MRSA and methicillin-sensitive S. aureus (MSSA) isolates revealed that the CA-MRSA strains were significantly more resistant to antibiotics erythromycin, tetracycline, gentamicin and rifampin than the MSSA strains. This finding was in agreement with a study performed by Dejing et al,25 in 2010. Although resistance to antibiotics ciprofloxacin and SXT were higher in the CA-MRSA strains than that of MSSA strains these differences were not statistically significant. Clindamycin was the only exception as the resistance rate in MSSA strains were in some cases higher than that of CA-MRSA strains. We assessed gene coding for enterotoxins A–E and G–J amongst the isolated S. aureus. Strains revealed a wide variability in carrying se genes; 77.6% of the strains were carrying one or more of the toxin genes tested. This result was partly consistent with finding in another study that reported 84.9% of foodborne strains harbored enterotoxin.26 In a Portuguese study, the prevalence of enterotoxigenic strains was reported 68.2%9 and another study performed in Italy reported a 59.8% prevalence of se genes in food samples.27 In Japan, Katsuda et al,28 found 183 (67.8%) out of 270 enterotoxigenic S. aureus isolates. In our study, SEA was the most frequently observed classic SE in enterotoxigenic S. aureus strains. In addition, seg gene was predominant enterotoxin in case of newly identified enterotoxin genes and it was also the most prevalent enterotoxin in our study generally. SEA, a major leading cause of food poisoning,29,30 is carried by prophage Sa3mu alone or by Sa3mw with other genes (seg and sek).31 In our study, the sea gene was detected in 25.5% (n=25) of S.aureus strains, and also in coexistence with seg gene in 14.3% (n=14). Enterotoxin SEH encoded on the chromosome.19 In our study, it was detected only in one strain isolated from cheese. This finding was consistent with the study performed by Alibayov et al.19 The seg and sei genes are usually detected together19; however, in this study these two genes were detected separately. There was a significant correlation between S. aureus isolates from butter samples and harboring se genes (p<0.035). However, no significant differences were observed between S. aureus isolates from other food samples and harboring se genes. Additionally, there was no statistically significant difference between raw meat and dairy product samples for harboring se genes. A statistically significant correlation was found between some antibiotic susceptibility patterns and carrying se genes in examined isolates. This included between cefoxitin and carrying sea and see genes (p=0.001) and between erythromycin and carrying sea, sed, and see genes, tetracycline and carrying sea and see genes, gentamicin and carrying sea gene, rifampin and carrying sec and see genes, and between SXT and carrying sea gene (p<0.050). S. aureus accounts for frequent contamination of food products and is a well-known clinical and epidemiological pathogen. The detection of the high rate prevalence of enterotoxin genes in this study indicates a potential risk for causing animal originated food poisoning. The increasingly prevalence of CA-MRSA and its emerging antibiotic resistance in foods is a serious problem for public health. Infected animals and infection during the processing stage are the most frequent transmission routes in food contamination with S. aureus or MRSA. Therefore, continuous surveillance and monitoring of pathogens with potential to infect foods and the emergence of MRSA and antibiotic resistance is necessary for public health. For this purpose, the utilization of antibiotics as growth promoters in animal husbandry should be avoided especially those frequently used for caring for both humans and animals. The authors would like to acknowledge the Vice Chancellor of Hamadan University of Medical Sciences for the funding and support of the study. Hennekinne J-A, De Buyser ML, Dragacci S. Staphylococcus aureus and its food poisoning toxins: characterization and outbreak investigation. FEMS Microbiol Rev 2012 Jul;36(4):815-836. Akineden O, Hassan AA, Schneider E, Usleber E. Enterotoxigenic properties of Staphylococcus aureus isolated from goats’ milk cheese. Int J Food Microbiol 2008 May;124(2):211-216. Argudín MÁ, Mendoza MC, Rodicio MR. Food poisoning and Staphylococcus aureus enterotoxins. Toxins (Basel) 2010 Jul;2(7):1751-1773. Bianchi DM, Gallina S, Bellio A, Chiesa F, Civera T, Decastelli L. Enterotoxin gene profiles of Staphylococcus aureus isolated from milk and dairy products in Italy. Lett Appl Microbiol 2014 Feb;58(2):190-196. Tang J-n, Tang C, Wang Y, Chen J, Liu J, Liu L, et al. Surveillance study of enterotoxin genes in Staphylococcus aureus isolates from goats of different slaughterhouses in Sichuan, China. Ann Microbiol 2012;62(3):1247-1253. Fusco V, Quero GM, Morea M, Blaiotta G, Visconti A. Rapid and reliable identification of Staphylococcus aureus harbouring the enterotoxin gene cluster (egc) and quantitative detection in raw milk by real time PCR. Int J Food Microbiol 2011 Jan;144(3):528-537. Jeyasekaran G, Raj KT, Shakila RJ, Thangarani AJ, Karthika S, Luzi M. Simultaneous detection of Staphylococcus aureus enterotoxin C-producing strains from clinical and environmental samples by multiplex PCR assay. Ann Microbiol 2011 Sep;61(3):585-590. Ahmady M, Kazemi S. Detection of the enterotoxigenic genes (sei,sej) in Staphylococcus aureus isolates from bovine mastitis milk in the West Azerbaijan of Iran. Comp Clin Path 2013 Jul;22(4):649-654. Pereira V, Lopes C, Castro A, Silva J, Gibbs P, Teixeira P. Characterization for enterotoxin production, virulence factors, and antibiotic susceptibility of Staphylococcus aureus isolates from various foods in Portugal. Food Microbiol 2009 May;26(3):278-282. David MZ, Daum RS. Community-associated methicillin-resistant Staphylococcus aureus: epidemiology and clinical consequences of an emerging epidemic. Clin Microbiol Rev 2010 Jul;23(3):616-687. Shore AC, Coleman DC. Staphylococcal cassette chromosome mec: recent advances and new insights. Int J Med Microbiol 2013 Aug;303(6-7):350-359. Yamamoto T, Hung W-C, Takano T, Nishiyama A. Genetic nature and virulence of community-associated methicillin-resistant Staphylococcus aureus. Biomedicine 2013 Jan;3(1):2-18. David MZ, Taylor A, Lynfield R, Boxrud DJ, Short G, Zychowski D, et al. Comparing pulsed-field gel electrophoresis with multilocus sequence typing, spa typing, staphylococcal cassette chromosome mec (SCCmec) typing, and PCR for panton-valentine leukocidin, arcA, and opp3 in methicillin-resistant Staphylococcus aureus isolates at a U.S. Medical Center. J Clin Microbiol 2013 Mar;51(3):814-819. Clinical and Laboratory Standards Institute. Performance Standards for Antimicrobial Susceptibility Testing; Twenty-Third Informational Supplement. CLSI document M100-S23. Wayne, PA. Clinical and Laboratory Standards Institute. 2013 Jan;33(1):29-37. Zhang K, Sparling J, Chow BL, Elsayed S, Hussain Z, Church DL, et al. New quadriplex PCR assay for detection of methicillin and mupirocin resistance and simultaneous discrimination of Staphylococcus aureus from coagulase-negative staphylococci. J Clin Microbiol 2004 Nov;42(11):4947-4955. Zhang K, McClure J-A, Elsayed S, Louie T, Conly JM. Novel multiplex PCR assay for characterization and concomitant subtyping of staphylococcal cassette chromosome mec types I to V in methicillin-resistant Staphylococcus aureus. J Clin Microbiol 2005 Oct;43(10):5026-5033. Wu D, Li X, Yang Y, Zheng Y, Wang C, Deng L, et al. Superantigen gene profiles and presence of exfoliative toxin genes in community-acquired meticillin-resistant Staphylococcus aureus isolated from Chinese children. J Med Microbiol 2011 Jan;60(Pt 1):35-45. Hwang SY, Kim SH, Jang EJ, Kwon NH, Park YK, Koo HC, et al. Novel multiplex PCR for the detection of the Staphylococcus aureus superantigen and its application to raw meat isolates in Korea. Int J Food Microbiol 2007 Jun;117(1):99-105. Alibayov B, Zdeňková K, Purkrtová S, Demnerová K, Karpíšková R. Detection of some phenotypic and genotypic characteristics of Staphylococcus aureus isolated from food items in the Czech Republic. Ann Microbiol 2014;64(4):1587-1596. Malachowa N, DeLeo FR. Mobile genetic elements of Staphylococcus aureus. Cell Mol Life Sci 2010 Sep;67(18):3057-3071. 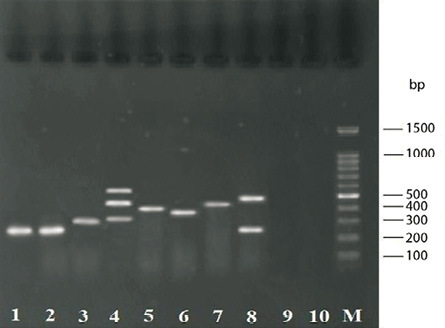 Dallal MM, Salehipour Z, Eshraghi S, Mehrabadi JF, Bakhtiari R. Occurrence and molecular characterization of Staphylococcus aureus strains isolated from meat and dairy products by PCR-RFLP. Ann Microbiol 2010;60(2):189-196. Aydin A, Sudagidan M, Muratoglu K. Prevalence of staphylococcal enterotoxins, toxin genes and genetic-relatedness of foodborne Staphylococcus aureus strains isolated in the Marmara Region of Turkey. Int J Food Microbiol 2011 Aug;148(2):99-106. Crago B, Ferrato C, Drews SJ, Svenson LW, Tyrrell G, Louie M. Prevalence of Staphylococcus aureus and methicillin-resistant S. aureus (MRSA) in food samples associated with foodborne illness in Alberta, Canada from 2007 to 2010. Food Microbiol 2012 Oct;32(1):202-205. Ertas N, Gonulalan Z, Yildirim Y, Kum E. Detection of Staphylococcus aureus enterotoxins in sheep cheese and dairy desserts by multiplex PCR technique. Int J Food Microbiol 2010 Aug;142(1-2):74-77. Wu D, Wang Q, Yang Y, Geng W, Wang Q, Yu S, et al. Epidemiology and molecular characteristics of community-associated methicillin-resistant and methicillin-susceptible Staphylococcus aureus from skin/soft tissue infections in a children’s hospital in Beijing, China. Diagn Microbiol Infect Dis 2010 May;67(1):1-8. Pu S, Wang F, Ge B. Characterization of toxin genes and antimicrobial susceptibility of Staphylococcus aureus isolates from Louisiana retail meats. Foodborne Pathog Dis 2011 Feb;8(2):299-306. Normanno G, La Salandra G, Dambrosio A, Quaglia NC, Corrente M, Parisi A, et al. Occurrence, characterization and antimicrobial resistance of enterotoxigenic Staphylococcus aureus isolated from meat and dairy products. Int J Food Microbiol 2007 Apr;115(3):290-296. Katsuda K, Hata E, Kobayashi H, Kohmoto M, Kawashima K, Tsunemitsu H, et al. Molecular typing of Staphylococcus aureus isolated from bovine mastitic milk on the basis of toxin genes and coagulase gene polymorphisms. Vet Microbiol 2005 Feb;105(3-4):301-305. Le Loir Y, Baron F, Gautier M. Staphylococcus aureus and food poisoning. Genet Mol Res 2003 Mar;2(1):63-76. Balaban N, Rasooly A. Staphylococcal enterotoxins. Int J Food Microbiol 2000 Oct;61(1):1-10. Kuroda M, Ohta T, Uchiyama I, Baba T, Yuzawa H, Kobayashi I, et al. Whole genome sequencing of meticillin-resistant Staphylococcus aureus. Lancet 2001 Apr;357(9264):1225-1240. Jarraud S, Mougel C, Thioulouse J, Lina G, Meugnier H, Forey F, et al. Relationships between Staphylococcus aureus genetic background, virulence factors, agr groups (alleles), and human dis-ease. Infect Immun 2002 Feb;70(2):631-641.